A cheerful, loving, lively, and naturally sociable dog, the Bichon Frise is a wonderful family companion who adores children and gets along well with other dogs and pets. Above all he wants to be close to his human family. He needs to spend as much time with you as possible, so you might leave him at home alone for a few hours, but not all day. He needs to play with you and he likes short walks. He's not an "outdoorsy" dog though, and would be just as happy romping around the house or in your backyard. Although he's good with strangers, he will bark or yap on their arrival, and makes a good watchdog. He is not aggressive or hyperactive. He can be a bit too yappy sometimes, especially if he's left alone. His barking means he might not be a good choice for an apartment, although he's equally adaptable to country and city life, and can be kept without a yard. He's relatively easy to train, but difficult to housebreak. He can be stubborn and needs clear rules to follow. He is also gentle and sensitive dog, and can nip at young children if they are too rough with him. He virtually doesn't shed, and would be a good pet if you like your house or apartment tidy and hair-free. 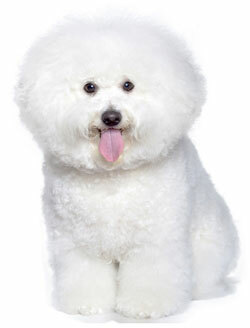 The Bichon Frise is 9 to 12 inches tall (to shoulders) and weighs 7 to 12 pounds. He has a long, curly coat consisting of a soft, dense undercoat and an outer coat that is coarser and more curly. His coat is white but may have a little cream or apricot color around the ears. Pet coat: You only need to brush his coat occasionally and clip short, for easy maintenance, every few months. Show coat: Requires 10 to 15 minutes brushing daily to keep it tangle and mat free and is scissored into shape every 6 weeks. The Bichon Frise is descended from the Water Spaniel, also known as the "Barbichon," later shortened simply to "Bichon." He was such a good companion and traveler that sailors began to take him on their journeys, and in this way he became popular throughout the Mediterranean, with a noted peak in popularity in Spain and France during the 16th century. By the 1800's interest in the breed had declined, although it renewed a century later. He was dubbed the "Bichon Frise" in 1933, and in 1934 was admitted to the French Kennel Club. The first American litter of Bichons was born in 1956 and the breed was admitted to the AKC in 1972. His AKC popularity was 32nd out of 157 breeds in 2007.